All patients who are considered for treatment with phototherapy or photochemotherapy must have a complete history and physical examination. Patients with a known history of lupus erythematosus or xeroderma pigmentosum should not be treated with phototherapy or photochemotherapy. 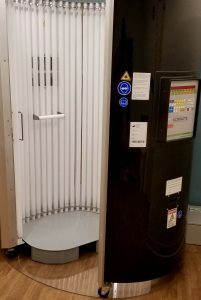 Patients with a history of a photosensitivity disorder, taking photosensitizing medications, with a history of melanoma, with atypical nevi, with multiple risk factors for melanoma, with multiple nonmelanoma skin cancers, or who are immunosuppressed as a result of organ transplantation should be screened carefully before initiating phototherapy or photochemotherapy. They should also be advised that adherence to their follow-up visits is imperative to obtaining maximal results. Office phototherapy and photochemotherapy should be performed under the direction of a dermatologist with the appropriate training and expertise. Experts recommend that patients be examined approximately once a month or more often if necessary, although specific data on the frequency of evaluations during phototherapy or photochemotherapy are lacking. Each patient’s treatment should be closely monitored by a nurse or phototherapy technician with proper training, and any abnormal findings should be transmitted to the treating dermatologist. 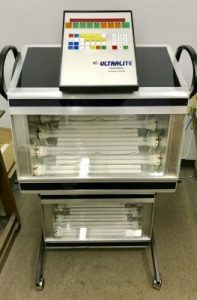 All phototherapy equipment should be maintained and regularly calibrated by appropriately trained personnel. Accurate records of the dosage and number of treatments along with any side effects should be maintained for every patient.